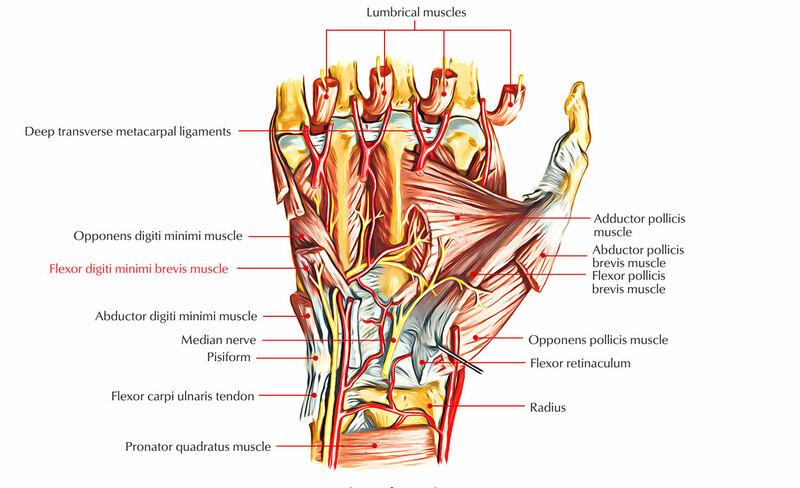 It emerges via the hook of the hamate bone as well as the surrounding flexor retinaculum and attaches along with the abductor digiti minimi muscle within the medial part of the base of the proximal phalanx of the little finger. 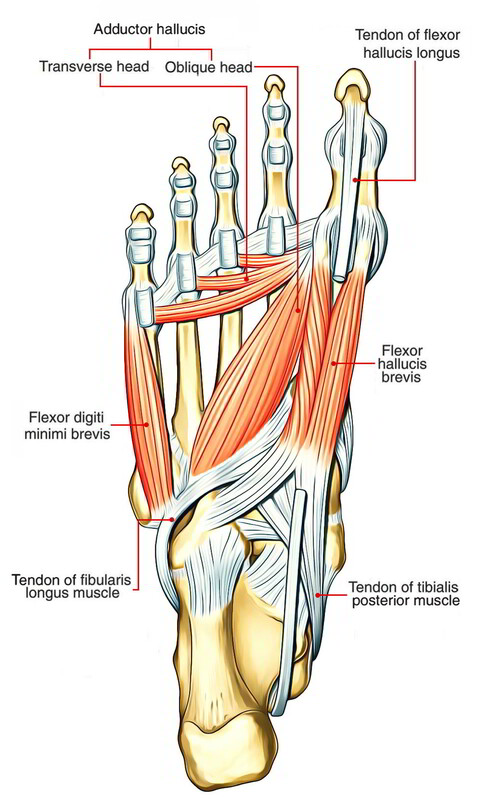 The flexor digiti minimi brevis muscle is lateral towards the abductor digiti minimi. Supporting the mass of the hypothenar protuberance, its real figure is covered by a coating of palmar fat. The flexor digiti minimi brevis is a quite narrow muscle situated among the abductor digiti minimi together with opponens digiti minimi. It is inserted in ulnar as well as portion of the palmar part of the base of the proximal phalanx of the little finger similarly with the abductor digiti minimi. The flexor digiti minimi brevis, similar to other hypothenar muscles, is supplied by the deep section of the ulnar nerve. The ulnar nerve has a superficial as well as deep section, but the section which supplies the flexor digiti minimi brevis is the deep section. Flexes the proximal phalanx of the little finger and also helps in abducting it. The flexor digiti minimi brevis muscle emerges through the plantar side of the base of metatarsal V along with surrounding covering of the fibularis longus tendon. It attaches on the lateral part of the base of the proximal phalanx of the little toe. The flexor digiti minimi brevis flexes the little toe on the metatarsophalangeal joint and also is supplied by the lateral plantar nerve. Flexor digiti minimi brevis emerges through the medial portion of the plantar side of the base of the fifth metatarsal, and via the sheath of fibularis longus. It has a distal tendon which attaches within the lateral part of the base of the proximal phalanx of the fifth toe; this tendon generally merges laterally together with that of abductor digiti minimi. Often, some of its deeper fibres reach the lateral portion of the distal half of the fifth metatarsal, comprising what may be referred to as a distinct muscle: opponens digiti minimi. The fifth metatarsal shaft is found on the deep side of flexor digiti minimi brevis, the interossei are located medially as well as abductor digiti minimi is lateral. The most lateral section of the lateral plantar nerve is located superficially as well as just medial towards flexor digiti minimi brevis. Flexor digiti minimi brevis flexes the metatarsophalangeal joint of the fifth toe. Creates slim tendon that combines with the abductor digiti minimi Through a narrow tendon within the lateral part of the base of proximal phalanx of the little toe. It flexes the proximal phalanx of the little toe.